Jim Robbins is a New York Times science writer. Ten years ago he began seeing the dense pine forest surrounding his Montana home die off, killed by the mountain pine beetle infestation. That attack, enabled by warmer winters, is still destroying northern forests. It's evidence of how global warming is adding to centuries of deforestation. By then he'd met David Milarch, a hard-living Michigan farmer whose life was changed by a near-death experience and what seemed like a subsequent visit by angels who gave him his mission: clone the oldest, largest, hardiest "champion" trees before it's too late. Scientists, not necessarily convinced by angelic instructions, were surprised they hadn't thought of this themselves. If it turned out to be possible (and often it did), it made sense. This time-tested DNA might provide a better chance for survival. Robbins chronicles the ups and downs of Milarch's efforts. One of his major successes was finding and cloning ancient sequoias in an unusually dry region of central California, under conditions that global warming may well replicate elsewhere. 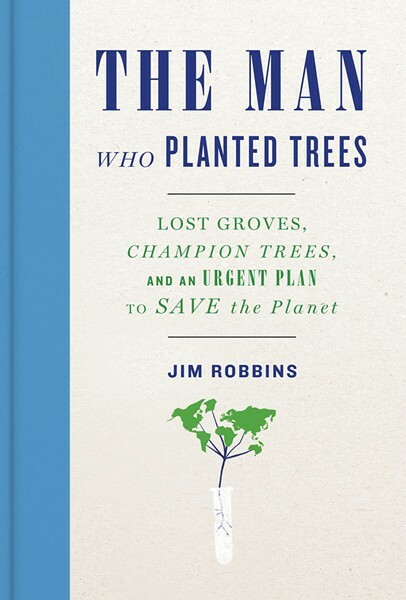 But Robbins also writes about trees themselves, their barely understood wonders and the ways in which they nurture the planet. He writes with clear objectivity but in a more complete way that mirrors the combination of standard and frontier science and the so-called mysticism in Milarch's world. Even scientists admit we know dangerously little about the trees and forests we've been relentlessly destroying. But Milarch's quest is not some feel-good exercise. He and others involved realize that planting the right trees in the right places is crucial. Along the way Robbins updates the exploits of Michael Taylor, the HSU grad who, while working at Radio Shack in Arcata, discovered several of the largest redwoods in the world in the Jedediah Smith Redwood State Park, together with HSU forestry and wildlands professor Steve Sillett. Taylor (who moved to Hyampom, an isolated town of 261 people in Trinity County) expanded his search for champion trees to other species and countries, searching for them partly by intuition. His incredible record improved even more when he teamed up with Milarch. "When I travel with David Milarch, we really find trees. It's beyond coincidence," he said. But Taylor helped Milarch most by finding champion stumps on private land, where only the owner's permission is required to obtain the cuttings to clone, eliminating a lot of government red tape. They started with the immense Fieldbrook Stump just outside Redwood State Park. From the stump and the redwood already growing out of it they hoped to grow hundreds and then thousands of copies. "We can use this tree as a symbol of the reforestation of the world," Milarch said. "This stump is back from the dead, same as I am."